Have you ever said something along the lines of ‘this match has got 0-0 written all over it’? If so then you’ve essentially already got to grips with the idea of a Correct Score bet. It’s a wager on the scoreline when the whistle goes to indicate full-time in a match, as I’ll explain in more detail as the article goes on. In many ways, this is the most basic of all bets. Unlike more complicated ones, like Anytime Goalscorer or betting on the number of corners a match will contain, this one doesn’t have many things that can complicate it, with neither the goalscorer nor the order they come in making any difference to it. Here I’ll explain all about the Correct Score bet, including having a look at the ways you can give yourself an increased chance of winning the wager. What Is a Correct Score Bet? As with other bets that I’ve written about on the site, I want to take a moment to explain briefly what a Correct Score bet is. It’s self-explanatory and many of you will already know what I’m going to say, but there are plenty of people out there who have never placed a bet before and might be wondering what I’m going on about. If you’re a seasoned bettor then feel free to skip ahead to the next section; though I would say it’s entirely possible that I’m going to say something you might not have thought about in this part of the piece. As I’ve just said, Correct Score betting is fairly self-explanatory. 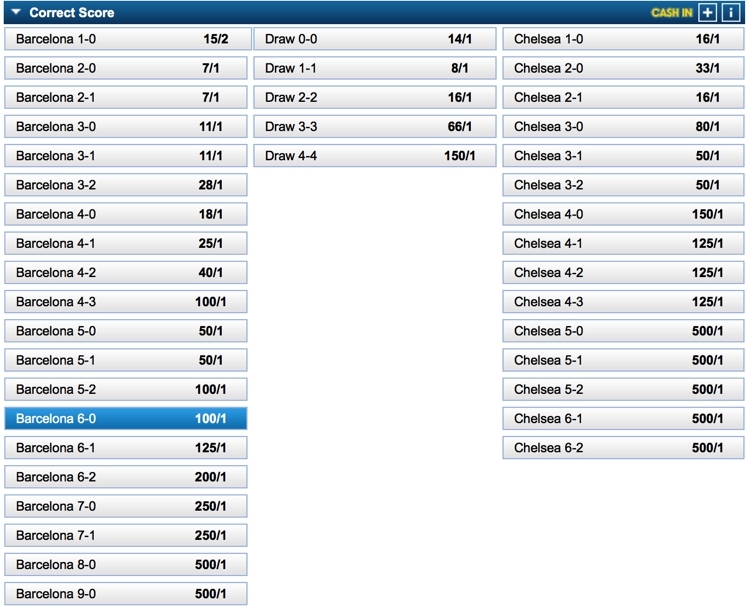 You’re placing a bet on what you think the correct score of a football match will be. It’s that simple. You can make pretty much any selection you wish, with the more goals you believe will be scored leading to higher odds. You can see from the picture of the odds on the Correct Score options of Bradford’s League One game against Wigan Athletic that William Hill don’t believe that it will be a high-scoring game. 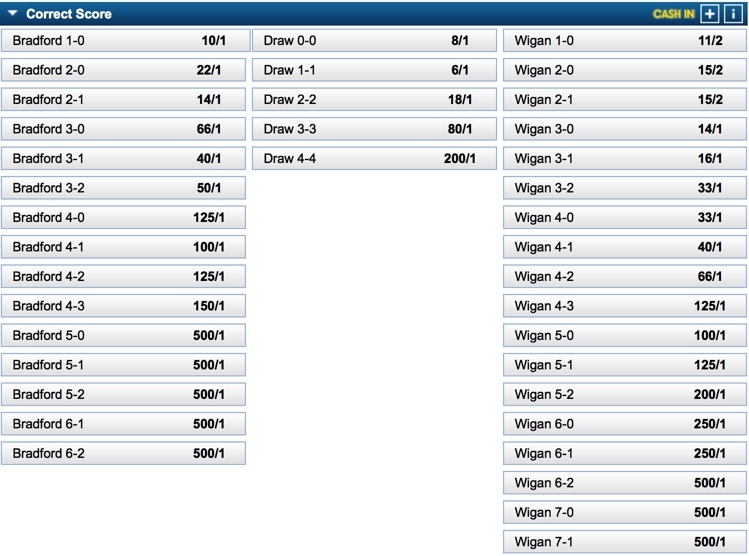 The lowest odds are for a 0-0 draw, with the highest being for a seven or eight goal thriller. A bet on the overall score will always give you longer odds than simply betting on the winner of the match, because you need to be more precise about what you think will happen. These were the Correct Score odds ahead of Chelsea’s match against Barcelona at the Nou Camp in the Champions League last sixteen back in the 2017-2018 season. The game ended in a 1-1 stalemate at Stamford Bridge, but you don’t need to take that into account when it comes to your match betting for the second-leg. That is to say, if you think this match will finish 2-2 at the end of ninety minutes then you simply select the 2-2 option, you don’t need to go 3-3 and include the 1-1 from the first-leg. Now as the last sixteen games in the Champions League are knockout matches and we’re looking at the Correct Score odds for the second-leg, it’s possible that the game will go to extra-time. In order for that to happen, of course, the score of the game will have to be 1-1 at full-time of normal time. If you’ve bet on 2-2 and both teams score again during extra-time, that won’t matter – the ninety minute score was 1-1 and so your 2-2 Correct Score bet would be a losing one. It’s also worth bearing in mind that straight Correct Score bets won’t be influenced by any occurrences within the match other than goals. That is to say, it won’t matter if a player is sent off, nor will the scorers of the goals make any difference to your bet. If all you’ve done is bet on what you think the final score of the match will be then you don’t need to worry about anything else. That’s different from if you opt for something like a Scorecast bet, which I’ve covered elsewhere on the site. Scorecast is a mini-accumulator type bet, which requires you to guess both the First Goalscorer and the Correct Score of a match and if you get one of those things wrong then you’ll lose your bet. What Factors Might Influence Correct Score Bets? There are any number of factors that might influence the outcome of a Correct Score bet. One of the most obviously considerations that you need to make revolves around whether certain players are injured, for example. If a player is the leading goalscorer of a team then they’ll rather naturally be less likely to score if he’s out injured. That’s the sort of thing that bookmakers will pick up on almost immediately and adjust their odds after accordingly. But what about something like a player that has got more assists than anyone else in the side being injured? Bookmakers are less likely to let that affect their odds immediately, so if you hear the information through social media or some other platform then it’s worth adjusting your bet accordingly. It’s not just the scorers or assisters of goals that will alter the possibility of a certain scoreline occurring, of course. If a team is quite dependant on a goalkeeper or defender to keep clean sheets or, at the very least, limit the number of goals that they concede then said team will be more likely to concede if they’re not playing. One example would be David de Gea at Manchester United during the 2017-2018 Premier League campaign. The Red Devils allowed an average of four shots-on-target every single match that season, which was significantly more than the 2.31 of their neighbours Manchester City and not far from the 4.27 of West Bromwich Albion who struggled at the bottom of the table. Yet David de Gea conceded very few goals, meaning that he was helping his team avoid defeats. Had de Gea been injured for a game then you might have fancied the opposition to score more goals, which might have changed your opinion on the Correct Score market. It’s not just injured players that can change the way scorelines work out. Suspensions can remove players from starting line-ups, not just because they’re banned for the game but also because managers might know that they’re one yellow card away from a suspension and therefore decide to rest them for a game to make sure that they’re fit for the following one. Speaking of things decided by referees, it might be worth doing a bit of research to see if a referee has a habit of giving penalties on a regular basis. Do they have a history of giving spot-kicks to one team more often than others? That’s the sort of thing that can easily influence the final score of a football match. You can see from this data, taken from Foot Charts, exactly how many shots on target each team in the Premier League has had themselves and how many they’ve conceded during the season, with the breakdown including the For and Against average per game. Shots on Target don’t automatically lead to goals, though, so this sort of data will just give you an indication of how things might work out in a match. Similarly a stat such as Expected Goals might give you a clue of what to expect ahead of a match kicking off. There were a few anomalies, such as Bournemouth’s 6-1 win over Hull City or Liverpool’s 4-0 defeat of West Ham, but generally speaking the majority of games fitted into the brackets above. If you wanted to play the odds, therefore, you’d place Correct Score bets of 1-0 or 1-1 and you’d have been right 76 times over the course of the season. That said, that’s only 76 games out of 380, meaning the percentage of games ending either 1-0 or 1-1 is remarkably small. Combining the knowledge you’re able to get from various online resources with the above list of scores will give you a decent chance of working out possible scores, however. 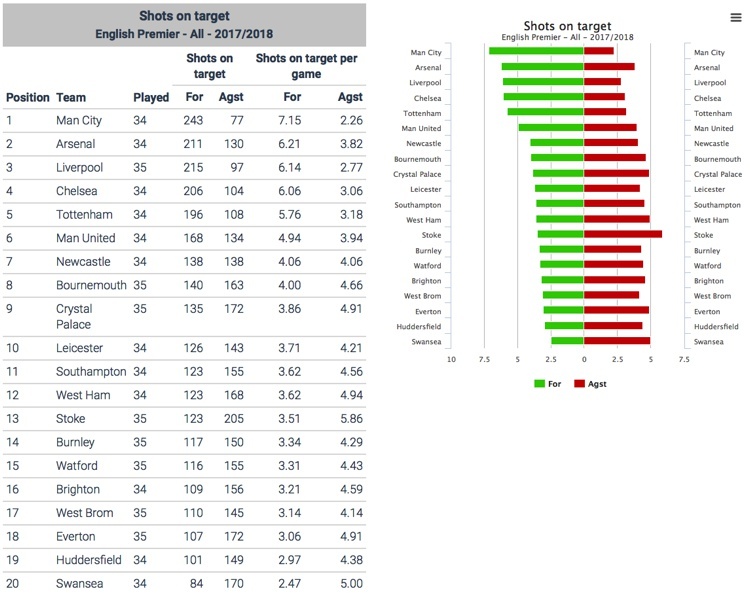 If you have a team that averages seven shots on target every game, for example, and the team that they’re playing averages five shots on target conceded per game, you can expect the first team to score two or three goals. Looking at the reverse averages will tell you how many the opposition side are likely to concede. What About Europe’s Other Big Leagues? You can see similarities here between the Premier League and the Bundesliga, with 1-0 and 2-1 being common scores. Interestingly, a 2-1 win for the home side is the joint-most common scoreline in the German league. Again, this is information you can bear in mind when placing your Correct Score bets. Once more, there aren’t huge discrepancies here. As with the other two leagues, there’ll always be a few outliers. Yet on the whole you’re looking at the same scores being common in Spain that were common in England and Germany, so the likes of 1-0, 1-1 and 2-1. French football always feels like something of an outlier compared to the rest of Europe, with those of us that don’t watch it imagining that there are one or two big teams and a load of others that are a bit rubbish. The results, however, suggest that that’s not really true. Once again we’re looking at the 2016-2017 season of a league containing twenty teams. Perhaps somewhat unsurprisingly by now, 1-0, 1-1 and 2-1 are the most regular scores in Ligue 1 as with Europe’s other main divisions. If you’re going to place a Correct Score bet on French football, therefore, you’ll want to follow the same rules as with those leagues. You can see that 0-0 isn’t that high on the list, which is unusual for a defensively minded division, with 3-1 actually being more common than it. 1-0 is a regular scoreline in Italy, but it’s 1-1 and 2-1 that are top of the list. Obviously one season isn’t necessarily reflective of the entire history of football, but it’s interesting that across the top four divisions around Europe the most common scorelines are all reasonably similar. That’s the sort of thing you’ll want to think about when you’re looking at placing your Correct Score bets, perhaps adjusting them according to the division that you’re betting on.